See No Evil - Season 5: Every second of every day, millions of Americans are caught on CCTV. Most of them are honest citizens going about their everyday lives. But a few are guilty of unspeakable crimes. 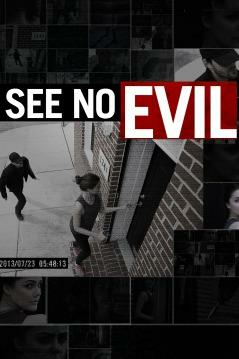 See no Evil is a ground breaking new series about how real crimes are solved with the help of surveillance cameras. Police reveal how CCTV footage has unlocked the answer to cases that otherwise might have remained unsolved- leaving dangerous killers at large. The series features real footage and dramatic reconstruction, combined with first-hand testimony from police, witnesses, and families.